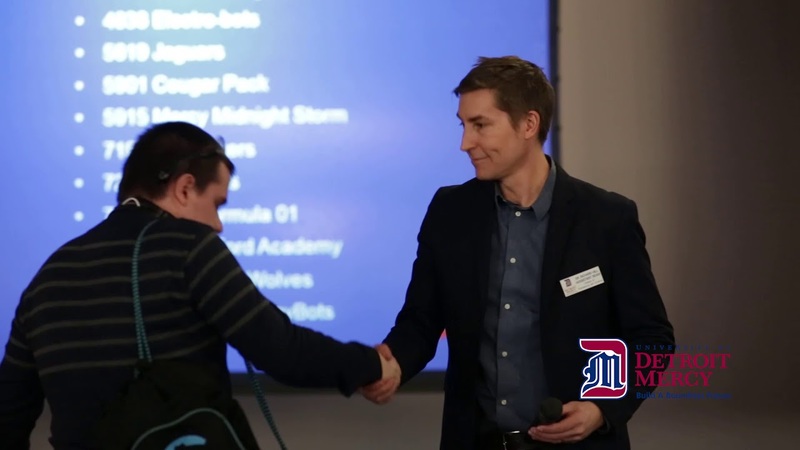 Nearly 200 high school students attended the FIRST Robotics Competition Kickoff at University of Detroit Mercy on Jan. 5. It was one of 146 kickoffs in cities worldwide where students gathered to watch a broadcast that would tell them the challenge for this year’s FIRST Robotics challenge. The FIRST Robotics competition has strict rules, limited resources, and an intense six-week time limit during which teams of students are challenged to raise funds and design and build industrial-size robots to compete in difficult field games. Director of Pre-College Programs Norman Bent distributed robot construction build-kits to new student teams in the Engineering High Bay while others held strategy meetings in various classrooms. University of Detroit Mercy students demonstrated robotic projects they developed during the school year as a source of inspiration. FIRST has been inspiring young people since 1992 in the high-school gyms of New Hampshire. FIRST Robotics Competition is one of four annual programs they administer that reach over 400,000 youth annually.